One of the highlights of attending UC Berkeley was the easy access to inexpensive good eats. One such place was Raleighs, on Telegraph. The first time I ate there, a friend ordered a huge hunk of mud pie. While it looked tantalizing (ice cream and Oreos– what’s not to like? ), my first thought was, I could make that for a fraction of the cost! So… I did. The next day, I pieced together four simple ingredients and wowed my friends. It was just as easy as I had hoped, and it was one of the first recipes I created and shared (on Xanga, if you’re old enough to know what that is!). A crowd-pleaser with just four ingredients and a practically no-fail guarantee– what more could you ask for? 1. Combine Oreos and butter. Press mixture into the bottoms and up the sides of a springform pan . It doesn’t have to be perfect. Tip: Use a straight-sided glass cup to get the corners pressed in nicely, otherwise there will be too much of an oreo-to-ice-cream ratio when you hit that corner of your slice. Also, it’s not required, but freezing the crust for a couple hours first will make step 2 much easier. 2. 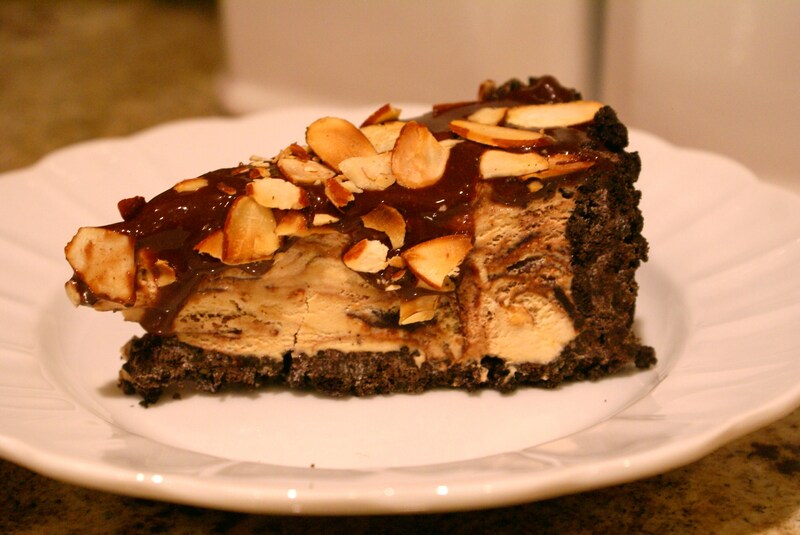 Use a spatula to scoop softened ice cream into the crust, spreading it evenly and smoothing out the top. 4. Sprinkle toasted almonds on top. Freeze until ice cream hardens, 3+ hours. You can make this way ahead of time and just take it out when it’s time to delight your friends! *If you have a food processor, use it. If not, do it college-style like I did: double-bag and seal the Oreos in two gallon-sized zip top bags, squeezing out the air. Bang with a heavy pot or roll/smash with a rolling pin until you have pea-sized pieces or smaller. It’s a great way to release some pre-midterm stress! **I know, I said four ingredients. This is the new fifth. It helps hold the crust together so packing it up with ice cream is much easier. Can you put whip cream on top and have it freeze well? I remember making these with you and remarking how simple and yummy it was every time you made it. An old favorite.